The insertion of needles at defined acupoints have two effects. First, it stimulates nerves which transmit electrical impulses to the brain and to the diseased area. The electrical impulse caused by the needles stimulate the proper regulation of the particular tissues in question. This is like a resetting mechanism. The body is naturally doing this, but when the body is weakened or the misbalancing influence of disease or injury is overwhelming the person may need assistance in this regulating process. Secondly, it has been shown that acupunctures' effects release chemical substances from the brain centers and pituitary gland. These substances are known as endorphins, serotonin, and others. They are released into the blood stream and are the body's own mechanism for pain relief. In the hands of a comprehensively trained acupuncturist, your safety is assured. 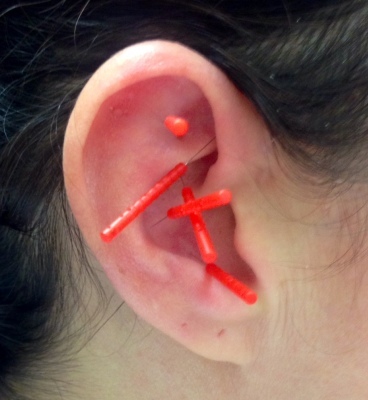 Acupuncture needles are sterile and are either disposable or autoclaved between treatments. If this is a concern for you, be sure to ask your practitioner about what type of needles he or she uses. Typically, the majority of the practitioner's time during a session is spent on the actual performance of acupuncture and related therapies such as moxibustion, and handwork to re-enforce the effects of the acupuncture treatment. In some cases, your practitioner may also recommend herbs, or dietary, exercise (such as yoga) or lifestyle changes.